Leading Manufacturer of aluminum golf set box, golf set wooden box and golf set in leather pouch from New Delhi. You no longer have to look for your golf equipment, the resolution is just here. The Golf Set Aluminum Box makes your task easy. These aluminum boxes are not only stylish but are easy to carry. So whenever you feel like playing golf, simply pick up the kit and walk ahead or you can also carry them while travelling. Apart from manufacturing, we also supply, trade, export and import these golf set boxes. 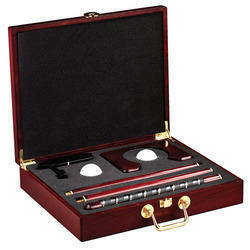 Our company has mastered the art in offering Golf Set Wooden Box to the clients. 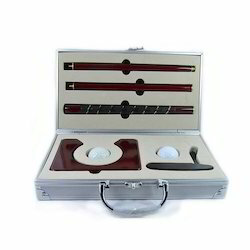 Golf Set Wooden Box is helps to keep all golf equipment at one place, so client don’t have to look for them here and there. This product is made by utilizing quality approved material with advanced technology by expert professional at manufacturing unit. Offered range is available in different colors, sizes, shapes and finishes as per clients need. This product is checked by professional experts on diverse quality parameters to ensure quality flawless before final delivery in market. With the extensive knowledge and experience in this respective domain we are engaged in offering Golf Set in Leather Pouch. This leather pouch is designed as per the set quality standards by utilizing world class material under the guidance of skilled professionals. Offered leather pouch is highly durable and recommended among our clients for their outstanding features. Our valuable customers can avail this leather pouch from us in quality packing within confine time.